To reach this delightful state with your friends, you’ll need a couple of hammocks and one or couple of trees to hang the hammock chairs from. Hammock chairs are simply amazing. You can actually enjoy all of the harmony and leisure of a regular hammock while sitting upright. And while a conventional hammock uses horizontal space, a hammock chair uses vertical space and takes less space making it perfect for hanging in small apartments, a bedroom, or even in your office. How to install a hammock chair inside your home, suspended from a ceiling, you can read here. 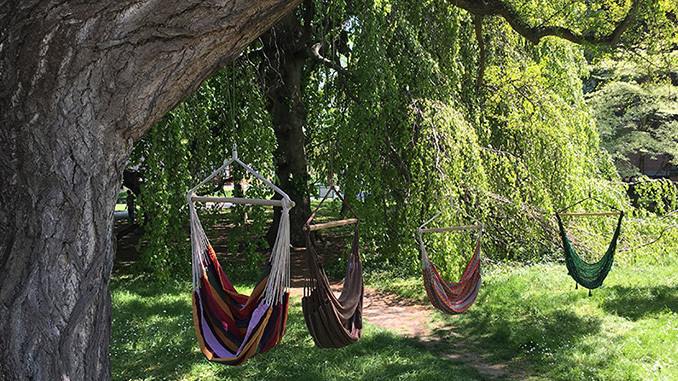 In this article, we’ll show you how to properly hang hammock chairs outdoors, from a tree, as many as you’d like, so that you can make a wonderful hang out for you and your companions. If you don’t have any, the first step is actually to buy hammock chairs. We recommend having a look at this one or this one hammock chair by La Siesta. 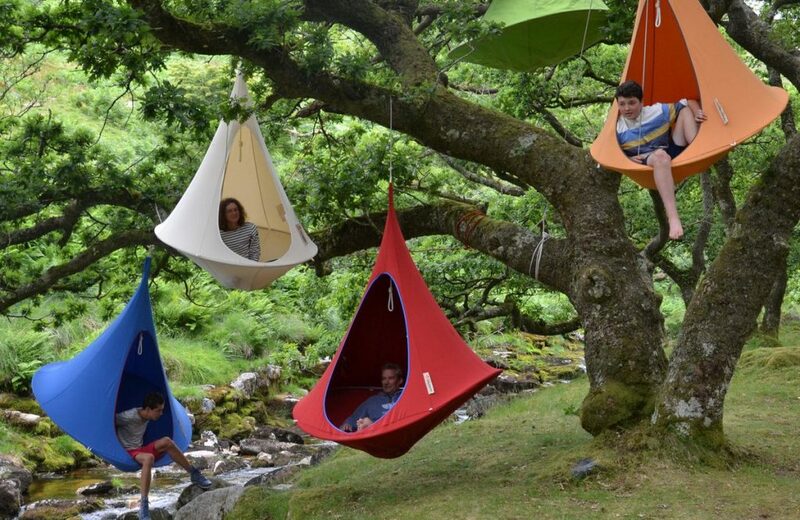 If you’d like to have kids around swinging too, the hanging nests are the best choice. And the second step is to pick a tree that can carry your great idea of ultimate hang out. The best option is to have a perfect big tree with plenty of strong branches for your hang out session in your garden, that can support this kind of gathering. The best are the trees with a short main trunk with several large but sturdy branches relatively close to the ground. Look for other signs that the tree is healthy. The tree that it is growing toward the sunlight, is a good healthy tree which gives you an angle that will effectively counter your weight, making for a stable hang. You’ll also want to find a branch with several sturdy branches nearby so that you can safely get out of the chair when you want to. But even if your tree is not big enough, several trees near to each other can also be an excellent location or look for good hammock chair spots all around the tree so you can combine. Generally speaking, a tree’s branches are stronger near the bottom of the trunk. Hang your hammock chairs at the bottom of the tree, where you can be sure the branches will hold the weight. Find a space low on the tree so that the entire hammock chair from top to bottom fits and you have enough room to dangle your legs. Remember, your chair will sink a little bit. We also recommend that the heavier people in your group use the bottom branches cause they are usually the sturdiest branches. Don’t you have a perfect tree in your garden? No problem, La Siesta have a perfect stand for four hammock chairs or hammock chair loungers at once! 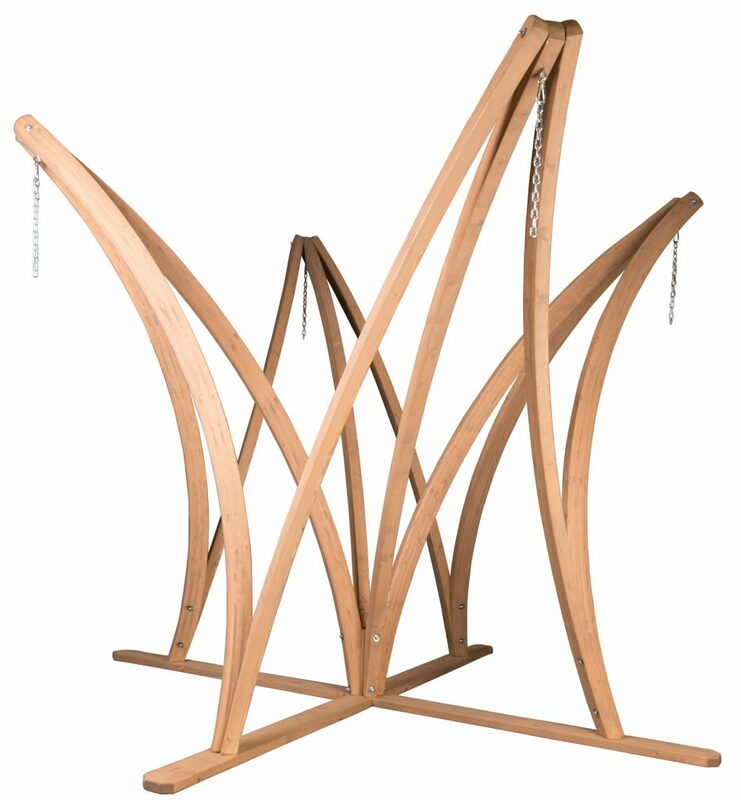 This excellent weatherproof hammock chair stand is perfect for quick and easy suspension without measuring, setting or knotting. Nordic spruce offers exceptional strength, due to its fiber density. 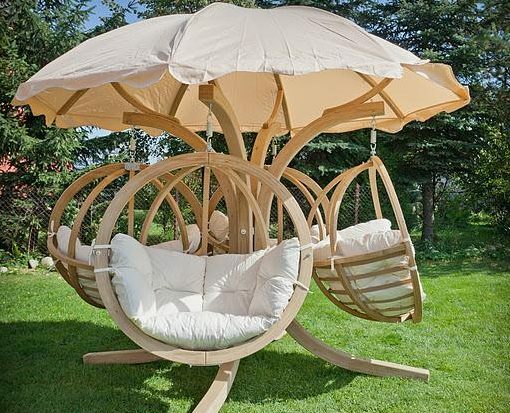 The hammock chair stand is sturdy enough to hold not only the fabric hammock chairs but also the wooden swing chairs. The Globo Chair is a perfect fit.